The only thing better than discovering new beauty brands is discovering new beauty brands that are wallet friendly. I was at Parramatta shops today, making my way from Myer to Priceline when my eyes caught on something colourful, something sparkly, something suspiciously looking like a makeup stall! Could it be? 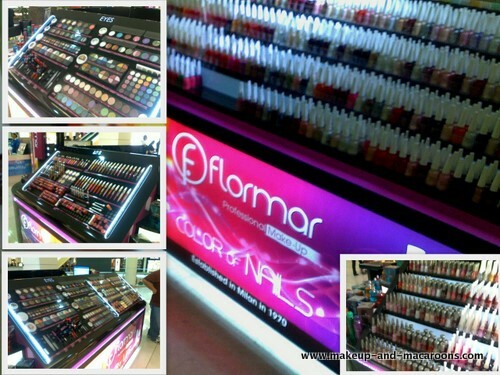 Yes, it was a new makeup stall called Flormar, and one that I had not seen in Australia before. You'll have to excuse the poor quality of these pics, they were taken on my phone. When I approached the stall all I could see where rows and rows of nailpolishes, a huge choice of lipcolours, and a pretty decent selection of eye and face products. I was literally overwhelmed by choice. I started swatching away before I even noticed the price, which started from $5.99. What The? These looked like great quality products, how can they be so cheap? At this point the lovely sales assistant came to my rescue. I started questioning her like crazy, but she patiently answered all my questions. 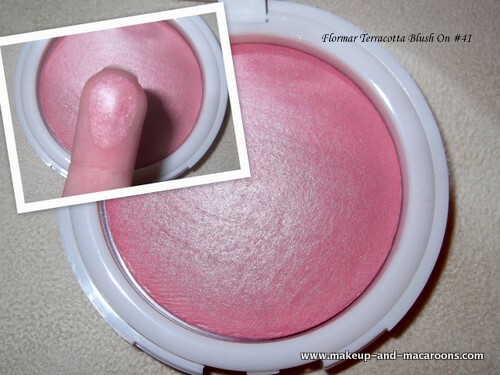 I found out that Flormar is not a new makeup brand at all, it has actually been established in 1970 in Milan but now is made in Turkey and they have stores all over the world. It has just come to Australia, and according to their Australian website they have a store at Castle Towers and of course now in Parramatta. I do hope they open more stores because the products were just ah-may-zing. If you live near the area, you have to check them out. I’m extremely impressed with the quality of the products, and with this price you can’t go wrong. I bought 3 Terracotta face powders (they remind me of a certain brand’s mineralize face powders) for $14.99 each and a lipstick for $9.99. 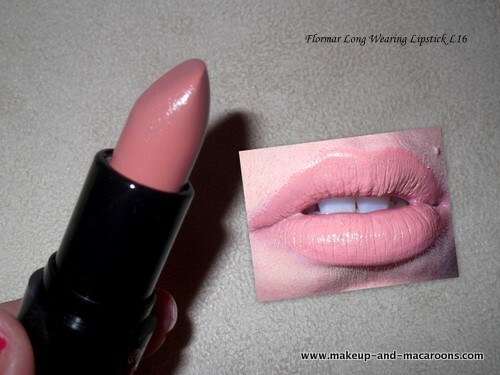 Here are some pics and swatches for you. I will use them in FOTDs in the future to show you how they look on the face. My camera had trouble focusing properly, I think the sparkles made it freak out! Have you tried anything from Flormar before? Will you be checking it out? For those of you around Parramatta, the stall is opposite Wittners shoes store on level 1 of Westfields. Look at all the nail polishes @_@ If one of these stalls open in my local area, my wallet is going to lose a few pounds! @LIng - they don't unfortunately, but I hope they open some up. It's seriously great quality. @Jadegrrrl - you def have to check it out, you'll love it. The choice is overwhelming! Make sure you allow heaps of time to swatch away. @Cincly - oh the polish stand just blew me away, I didn't know where to start so I just avoided the nailpolishes until a later day when I'm mentally more prepared. The polishes were only $5.99, bargain! @Nephele - oooh thanks for the added info, I just looked further into their website and yep, it says established in Milan but made in turkey. Wherever it's made, it's definitely great and i'll be buying more. @Michelle - I take my blogger role very seriously, LOL. 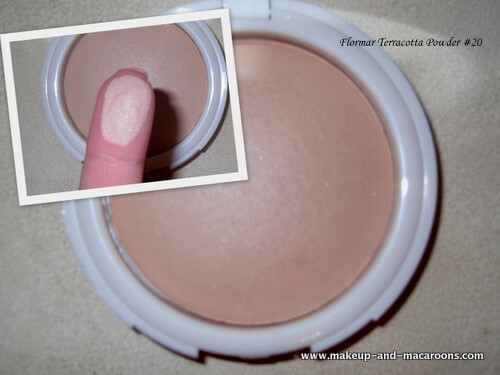 I am using the Flormar Two way Foundation and I love it. I recommend the brand it`s good and affordable! I vaguely remember passing this stand a couple of weeks ago but didn't have time to stop & have a look-see. 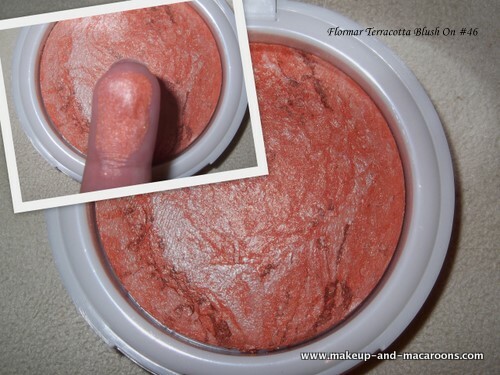 Thanks for 'researching' the brand for the rest of us fellow beauty mavens ;) Those mineralize blushes look very promising! So great to have these blogs from you. @ligata - oooh I must check out the foundation, thanks for the recommendation! @lori - they feel really smooth and are very pigmented too, great find. @hannah - I hope so too! Oh and re pics, I got picasa installed so I'm playing around with that! @kerrasan - cool, check it out. definitely bargain prices. I didn't get a chance to check out the creams as I was too overwhelmed with the makeup choices to look at the other stuff. @beautysnippets - next time you're at parra check them out, the blushes are just fab! @Kath - maybe next time you visit my in-laws you can go via castle towers? there's a store there, tho I'm yet to check that one out. And they are a wallet friendly brand, so bonus! Oh and i'm glad you're enjoying the blog! I have never heard of this brand before! The blushes look amazing especially number 41. Love the lippie on you! Those products look amazing :) Can't believe the prices! i think sirvinya on youtube once talked about it! 8D That's seriously the best kind of research I've ever heard of. Unfortunately I couldn't find anything about this brand being available in the US. It's a shame! The products look really promising. I adore the lipstick on you. Nothing in Canada yet I see, but I'll keep my eyes peeled, it looks good!! Not crazy about the name though... Flormar sounds like some kind of floor cleaning solution. OH! I need to pay Parra a visit very soon!!! Love the look of the pink blush! What a bonus that they are affordable too! I'm hyperventilating at the sight of all those Flormar polishes!! I've seen swatches online and they look fabulous so I am SO getting myself to Parramatta soon! Eeeeeeek!!! Thanks for doing the research for us lol. Neat new brand you discovered, I do like the lipstick you posted. Very pretty shade! I found this place in Castle Hill when I visited a friend last month. I didn't buy anything because the sales assistant really annoyed me. It was such a shame because their products are so so so pigmented! I was taken aback because they were so cheap. Parramatta isn't close for me either. Someone open a stall near me please! They don't have a store in Melb? Noooo! :( The stuff looks amazing! Thanks everyone for your comments, I'm glad you enjoyed my little "find" and research. I can't wait to show you more swatches of these products because they are just fabulous. I can see myself returning to the stall over and over again! This is awesome!! I am going to have to check them out. If that is how cheap they are in Aus I wonder how much they cost in the US!! I've never tried it, but it looks like it's going to work out for you! What wonderful swatches :) Btw - I awarded you on my blog - come check it out! I have tried a couple of things! !Great ones for the price!thanks for the post hun!! I was just searching on eBay last night, i've founded the flormar products in eBay, they are also selling on eBay in NSW,if the products quality well,as you guys told us,, i am gonna order from eBay,because i am living far away to Sydney,anyway, i just wanted to tell you guys..When i buy the products, i am going to tell you guys about the quality..
^ glad to know its possible to get some from somewhere! all looks very promising, those terracotta blushes are telling me to buy them hahaha! Oh my goodness! I'm going to Parra on Saturday!! Those blushes are amazing! OMG best I start saving now in case they come to Adelaide. @Caramel - i'm really impressed by this brand, their products are seriously amazing. At the moment there is only one shop here in Australia but hopefully they will open more as so many people want to try these now. Flormar made in TURKEY.ı am from Turkey. Some products are not made in Turkey, they are made in Germany weirdly enough. Well, they are if you buy from the Netherlands anyway. Flormar have now also launched in the US with locations in New York State and Virginia. Flormar have now also launched in the USA. They have location across New York State and Virginia. I'm from Dubai ..Luckily, there is a flormar outlet in a mall nearby and it has become my recent favourite. Like u said, their products are really good, especially, the Primer, Bronzer, Long wearing Lip gloss, waterproof mascara and the nail polish collections. Have tried them all and in love with the texture and smell ..;-) not really convinced with their foundations though, so will keep using my Rimmel..s, have to accept that due to the affordable price, they only focus on product value and not the packaging,,i accidentally dropped my bronzer (due to the big size) and the lid came out from the pack ;-( my recent purchase was their contouring brush and am absolutely loving the softness of it..